Be sure to buy or order the attachments you need for your upcoming projects this year to insure you will have what you need when you need it. New attachments can have long lead times, so order them now to have in time to use them for your upcoming projects. That Listing is not currently active. View Similar Listings, return to Home Page, or search by Stock # below. Hours Of Operation: 8-5 M-F Pacific Time. Weekends by appointment. 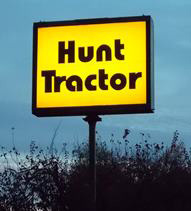 Copyright © 1999-2019 Hunt Tractor Equipment & Parts, Inc. All rights reserved.